Sometimes, mostly at the weekend, I feel like jumping out of the bed and make some delicious cake. But I mostly feel guilty when I am supposed to use lots of ordinary white flour and sugar. 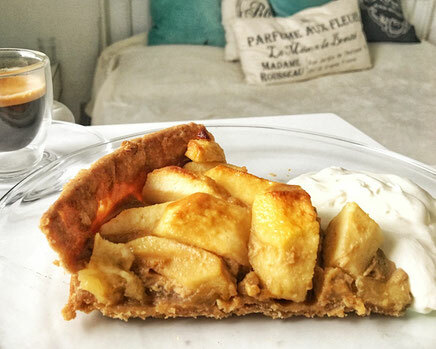 So I came up with this healthier version of my most favourite Apple cake of all times from my favourite chef raymond blanc. Apple tart maman blanc by raymond blanc. Mix together flour, butter and pinch of salt and put them into a food processor. After your mixture becomes a bit sandy, add 1 egg and splash of water. Mix well. All together about 3 minutes. After it is done, put the dough onto a lightly floured work surface where you kneat the dough for about 30 seconds until nice and firm. Roll the dough out to get a nice flat-like form about 1cm thick. Put the dough in between two sheets of cling film. It will ease your further manipulation with the dough. Store the dough in a fridge for 30 minutes. 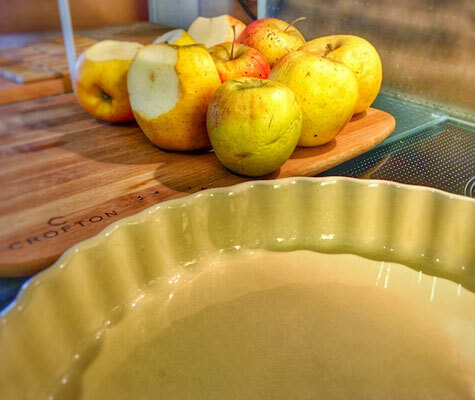 After you took the dough out, take your apple tart baking dish, - I used the ceramic one. Roll the dough to 2 mm thickness. Then transfer the dough onto your baking tray/dish, which you do not forget to grease with butter beforehand. Cut off the excess pieces of the dough around the dish edges. When done, prepare your "Apple brush". Melt your 15g butter in a saucepan with sugar and splash of lemon. Let the sugar to dissolve. Set aside and pour in cognac (in better case you can use calvados). Peel the apples and slice them into chunks, similar size each. 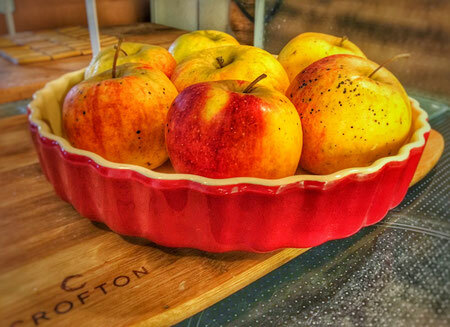 Arrange the apples all over your baking dish as you can see on a photo below. Brush the apples with your cognag mixture. Preheat your oven to 220 degree of celsius and let the cake bake for 10 minutes. 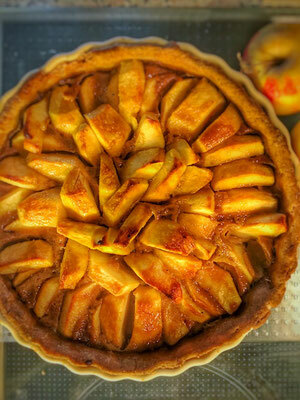 After 10 minutes reduce the heat to 200 degrees and let the tart bake for another 20 minutes. Put double cream into a bowl, stirr in 1 egg and 50 grams of coconut sugar. 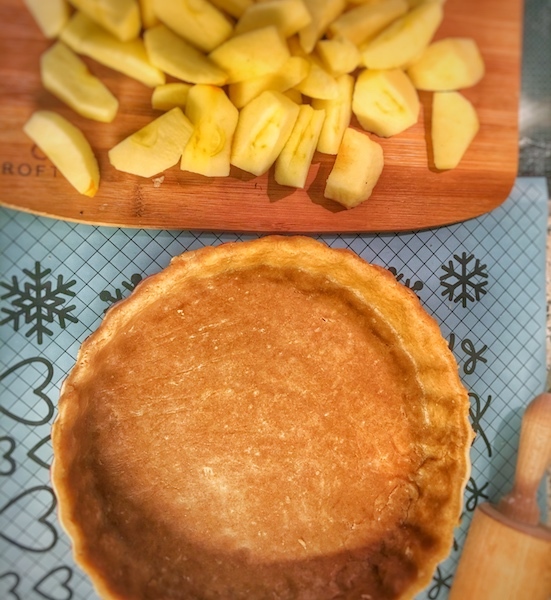 After 20 minutes of baking you take out the the tart and pour in your custard mixture. After that - you should see how nicely set is your filling now. Take the tart out of the oven and let to cool down for at least 30 mins. Serve with wipped cream and vanilla ice cream on a side, if fancy.